The water well dedication Kate attended during her trip to India. As I looked around me, I wondered how such a beautiful paradise could exist in the midst of such poverty and destitution. It wasn’t the beautiful landscape that caught my attention in my February trip to India (though to be sure there are many beautiful sights), but rather the inexplicable joy radiating from my brothers and sisters in Christ. 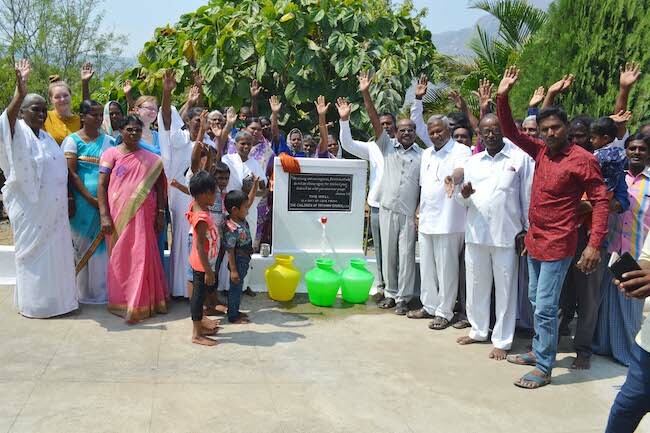 During my 12-day trip to see the amazing works God is doing in India and gather testimonies, I had the privilege to attend a water well dedication at an indigenous church planted by an IGL pastor. India is a country that loves celebration and ceremony. So, every time a new water well is dug or a new Life Center is built, they have a special dedication ceremony. IGL ministry leaders give a sermon for the occasion and then the pastor opens the spicket to the water source or cuts the ribbon going into the church for the first time. In this particular village, a drought had set in over the last year. Water was so scarce people often didn’t have enough for cooking and drinking, let alone washing clothes or themselves regularly. The 5,000 families living in the village had to make the long trek on foot every day to another water source, which didn’t even have clean water. Thankfully, a U.S. church generously gave the money to build a well at the church in this village. Of course, the villagers and local believers were excited about their new well. But what struck me was the greater joy they had in Jesus than about their new water source. They couldn’t stop talking about how much Jesus had transformed each of their lives and brought them so much peace in the midst of pain and suffering. Imagine that: this water source drastically changes each one of their daily lives because they have water to cook with, drink, wash with and they don’t have to spend their entire day walking to the not-so-nearby other water source. But to them, this was inconsequential compared to the gift of living water they had received from Jesus. The 32 believers in the village are excited to share not only their new water source at the church with their neighbors, family and friends, but to use this as an opportunity to tell them about the far greater water they can receive: Jesus’ gospel. This well is just one of nearly 300 built over the last five years that stands as a reminder and a picture of the living water Jesus offers each of us. I hope in my own life, the things I own and the blessings I’ve received will not be my source of joy or happiness, but rather serve as a picture to remind me of the One who gave them all. I pray we all remember that Jesus is our greatest gift, just as our fellow brothers and sisters do in India.